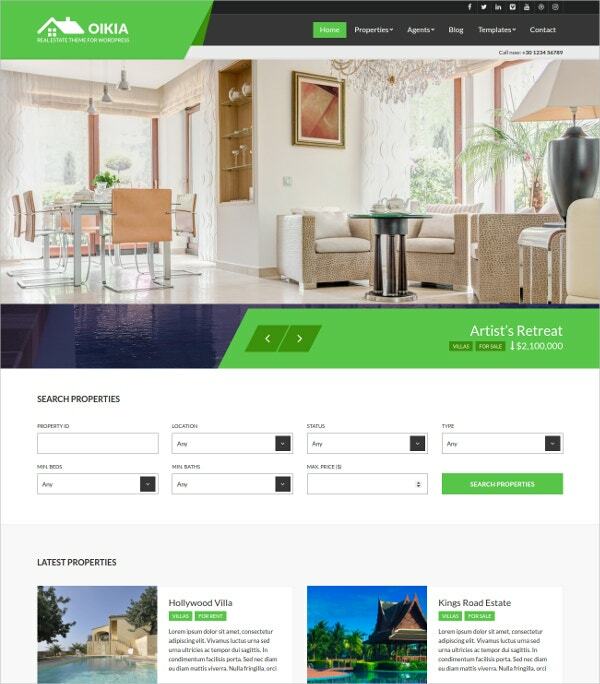 Property agents, landbroker services, home staging websites and other professionals in the real estate industry can tailor their websites with the help of Real Estate Website Templates. These templates let you showcase listings and portfolios easily in gallery and slider formats to set up a channel to communicate with your site visitors. You can easily modify design aspects like typography, palette, color etc. with in-built tools. You can find a suitable template from the list below, for your preferred CMS, whether WordPress, Drupal, Joomla , HTML or others. 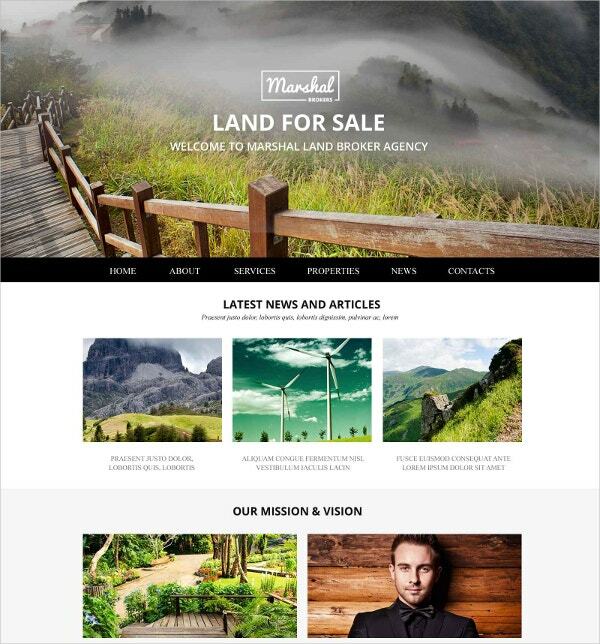 The Land Brokers website template is a visually rich theme that you can use to give potential customers an idea of what they can expect from a home or land they are looking to buy. The black and white theme is clean and fuss-free. With grids, ghost buttons and social media icons it makes for modern and easy to share template. It is coded with HTML5 and CSS3, and has a 1170 grid system. The valid semantic coding keeps it lightweight and quick-loading. 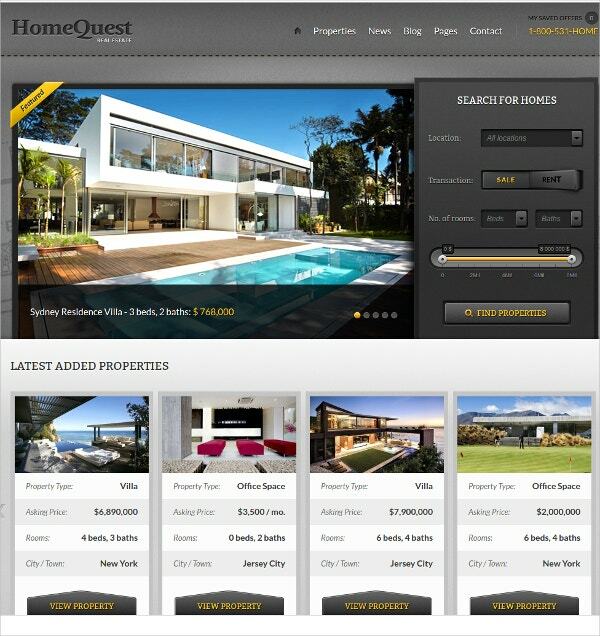 Quick Sale is a responsive theme with plenty of features for a high quality listings website. It comes with a Visual Composer that lets you drag and drop elements to build your site. You can add an events calendar, support online booking and integrate WooCommerce. It comes with 27 gallery styles and a single click installer to get you started. 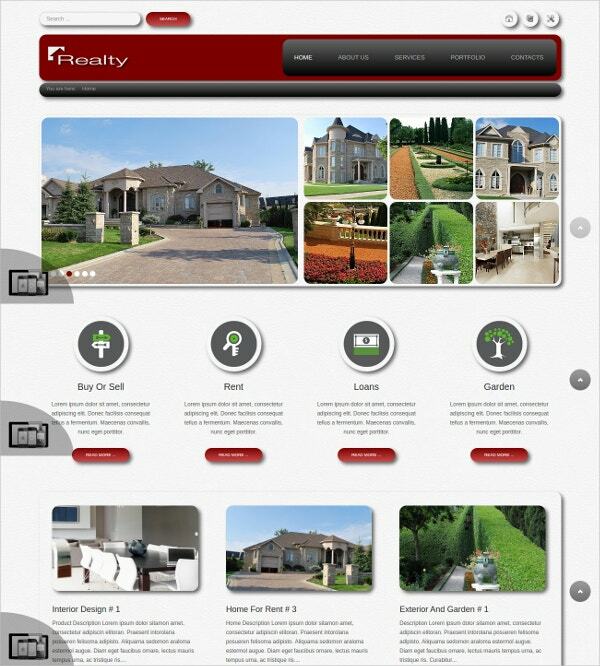 Take advantage of the security and powerful CMS of Drupal with this real estate agency responsive template. It has a unique aesthetic with a dark color palette accented with bright trendy colors. The template features two columns and a wide 1600 px layout. It comes with an admin panel for easy customization and the animation is coded with HTML plus JS. Real Homes is a beautiful minimalist theme for property listing sites. 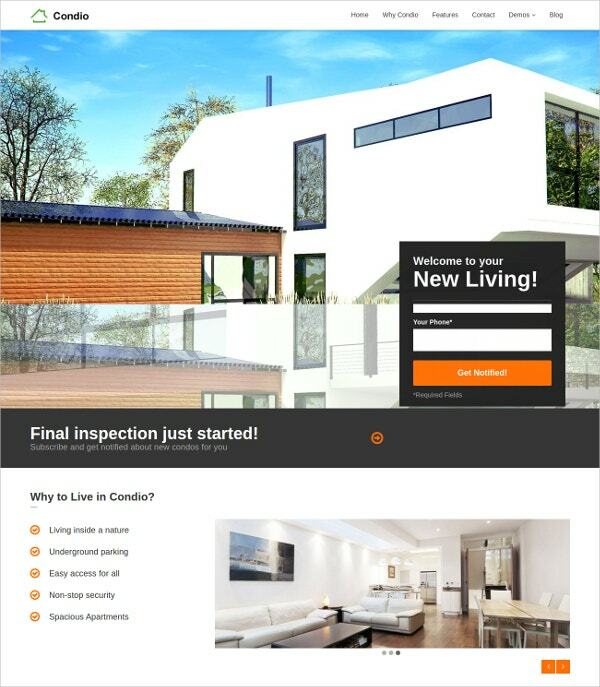 With this theme, you can offer customers an advanced search and arrange listings in a grid or standard list. The details page lets you add plenty of information through premade meta boxes to which you can add your own. You can also easily add floor plans, Google Maps, several types of file attachments for each property and a lot more with this powerful theme. 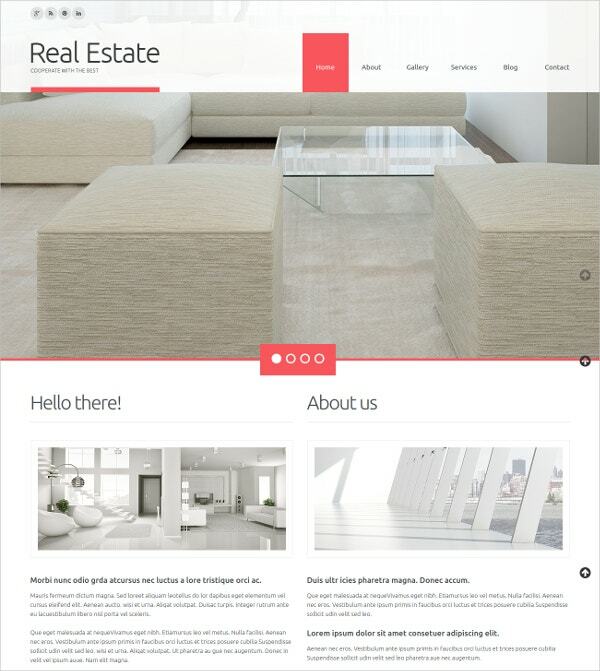 This simple and modern responsive theme is suitable for small businesses in the real estate industry. It is easy to customize and you can add a homepage slider with images and parallax effects for added interest. The Lazy Load effect will also enhance a grid display of properties. It is coded with HTML5 and CSS3, and includes 1170 grid system, JQuery elements and valid semantic coding. It also includes a premade on-line chat system. 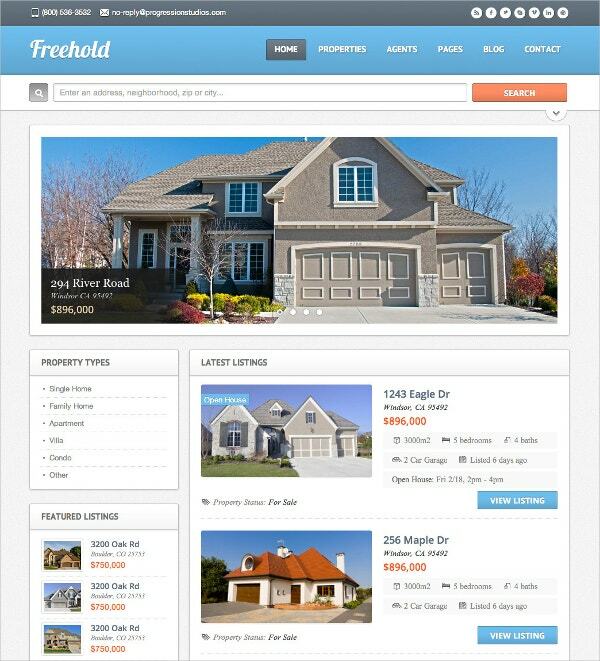 Freehold is a simple but functional example of Real Estate WordPress Themes that are available to you today. 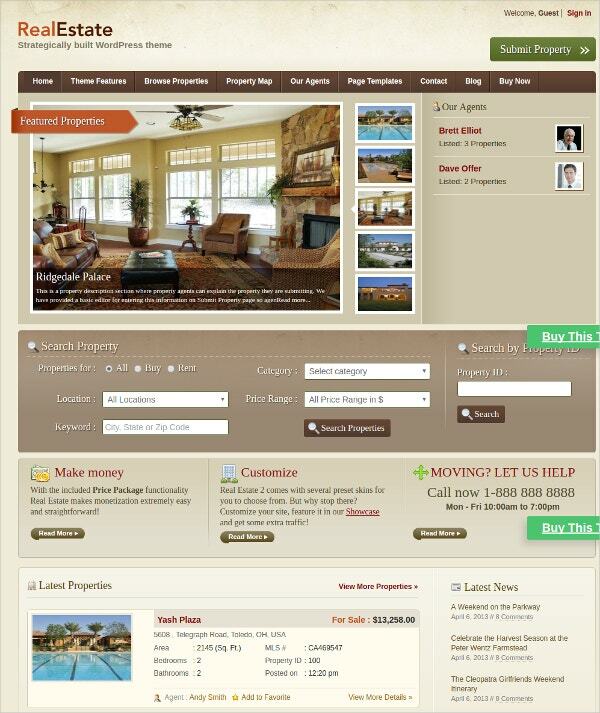 The theme comes with a property listings search, fully responsive layout and unlimited color schemes. It is also optimized for retina displays on devices like iPhones and Macbook Pro, so your website will look great on any screen. 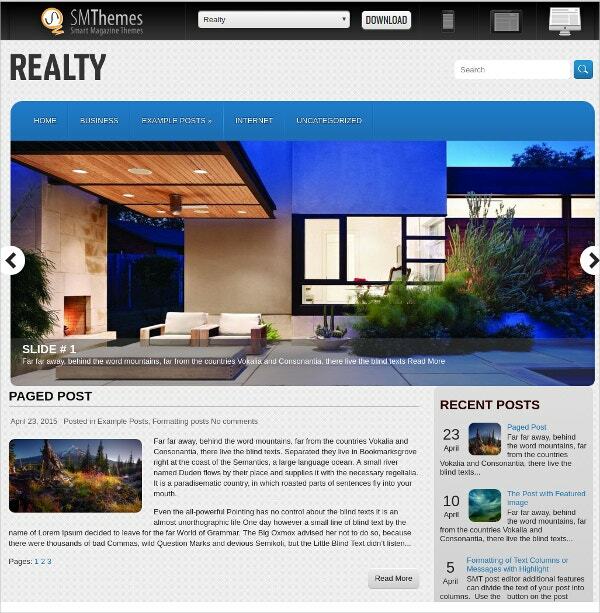 Realty is a Joomla theme with a professional but warm color palette that will give visitors a welcoming experience. It is built on the AS Framework and bootstrapped for mobile devices. You can redesign the template through its 20 module positions, 8 color styles, over 40 Google Fonts and add interest with plugins like the AS Responsive Menu, AS Art Slider and AS Scroller. You can use the Home Quest template as it is or tailor it for your needs directly from the WordPress admin area. It comes with four premade styles and bright colors of orange, turquoise, yellow and green. The theme is responsive and retina ready of course with crisp icons and text. Features include shortcodes, sidebars, one-click content installer, editable CSS and PHP files, theme updates and premium support even on the standard membership. 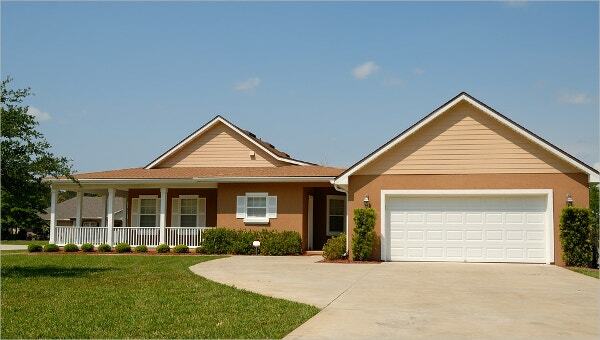 You can also see Real Estate Templates. 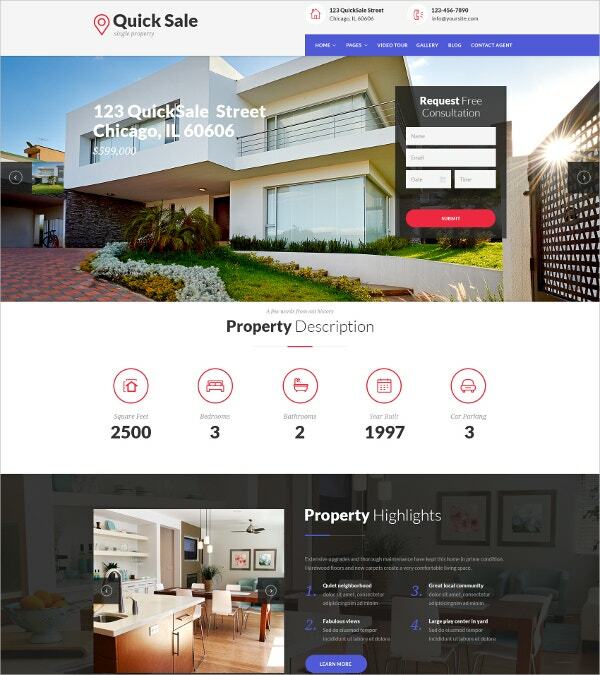 Oikia is a bright and modern theme with a unique visual design that will appeal to property buyers. Features include easy drag and drop widgeted homepage building capability, custom widgets for content, social networking, Flickr images and more, dynamic maps and filtering etc. You can customize the color scheme, translate all text by editing just one file and receive great support on the developer forum. This Joomla template is a light-colored template with bright accents out-of-the-box and parallax effect on oversized images. But you can customize a lot of the elements in the demo and make it your own. The bootstrapped theme comes with an admin panel, commenting system, Google map and Web Fonts, modules, Favicon, social options, tooltips, sortable gallery, background video and more. 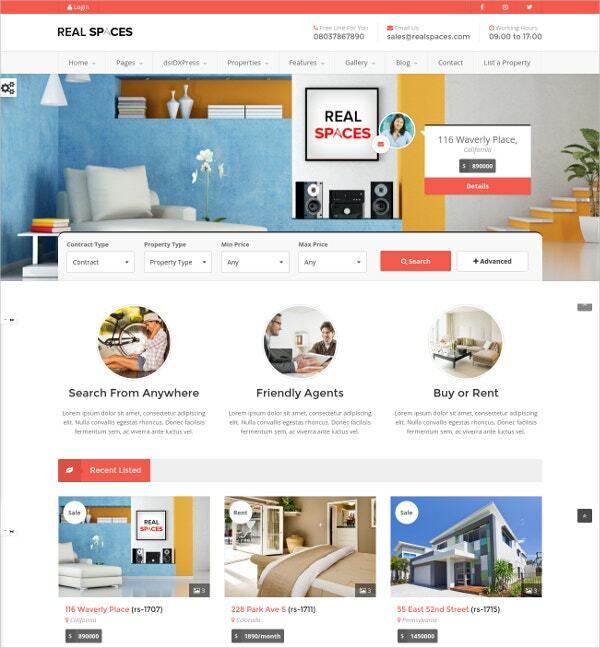 Real Spaces is an elegant and light theme with Paypal support for paid property listings. It is bootstrapped and responsive. Install the theme with a single click and then go ahead and redesign it with the multiple blog and gallery layouts and page templates available to you. You also get a $25 Isotope Galleries for free. 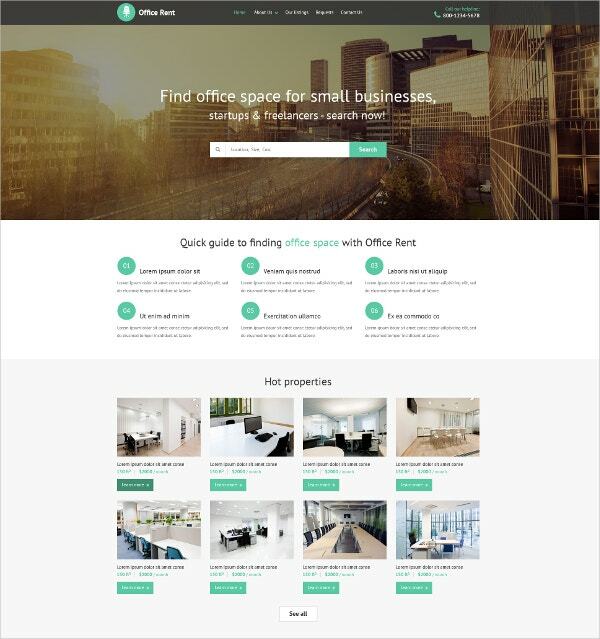 Real Estate Agency is a classy WordPress theme with soothing colors. It is built on the Cherry Framework which gives you plenty of widgets, shortcodes and bootstrap options to customize as you want. Other features include parallax effect and the option to place up to ten custom slides on the frontpage. Realty by SM Themes is a simple, modern theme for WordPress with a calm blue-based color palette and plenty of spaces for visual elements. The theme is built on the SMT Framework and supports WooCommerce. It comes with custom sidebars, Google Maps shortcode, custom widgets, dynamic content loader etc. It supports Ecwid and lets you translate to other languages. 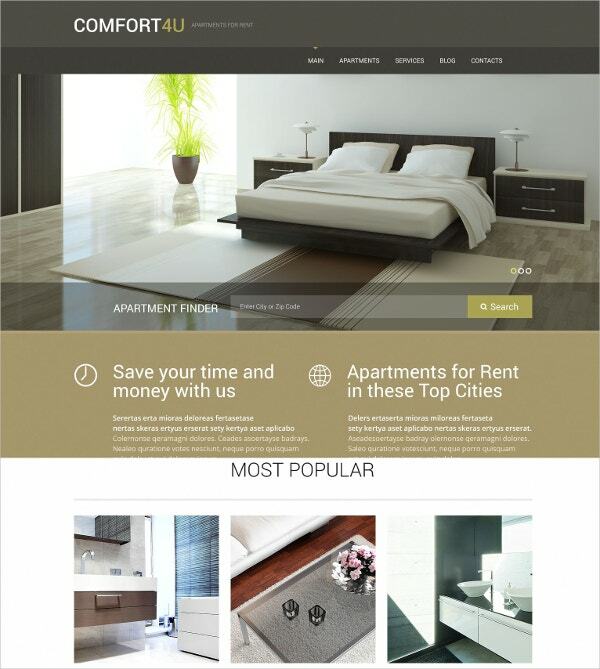 Yet another WordPress theme with elegant colors, Apartment for Rent is designed to woo your customers with images of luxurious apartments. It is responsive as it should be, and the parallax scrolling effect adds dimension to images. Other features include sliders, SEO readiness, auto updation and a selection of widgets that you can customize your website with. Condio is a WordPress template with a fresh and light professional look. It is designed to give your conversion rate a boost. You can customize the theme to be one page or use the landing page template. The theme comes with three homepage versions with video background, parallax effects and fixed header. You can add subscription forms, contact form, Google map with markers and many other useful elements to give your customers a great experience. 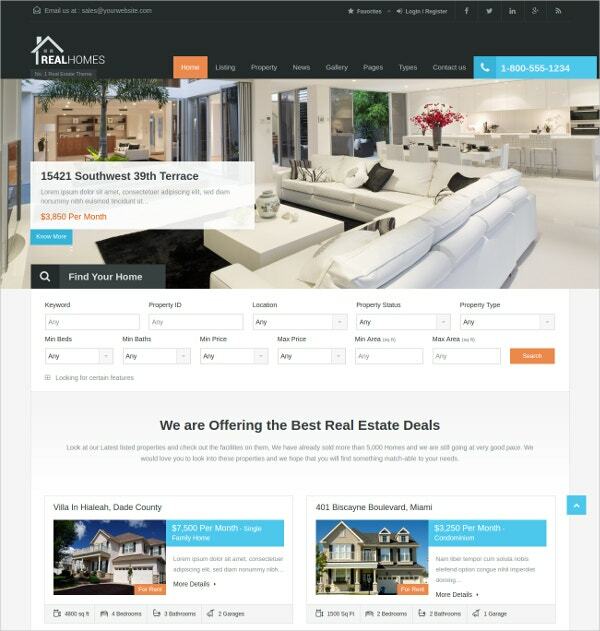 The Real Estate 2 template demo uses vintage colors and a warm palette that will attract visitors to your real estate website. It has a clean look and plenty of functional features for a unique website. Highlights include a dynamic slideshow of peer-selected featured properties, and several widget-ready areas such as on the sidebar, the footer and other areas on the page. A well-designed property listing page, detail page, customizable submit property forms and more makes this a great addition to this list. 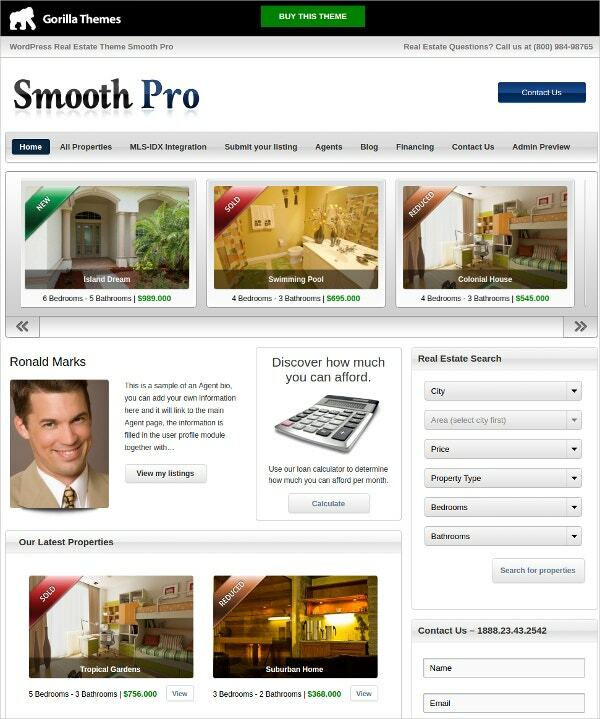 Smooth Pro is a simple, mobile-responsive WordPress theme with Google Maps, property galleries, slideshow and a professional layout for realtors and agents. It is a responsive and retina ready theme, and the dsIDXPress plugin integration lets your visitors search through indexed property listings. You can change metrics and currency, set up widgets, choose from five color styles and even set the website up to be used by multiple agents in your company. 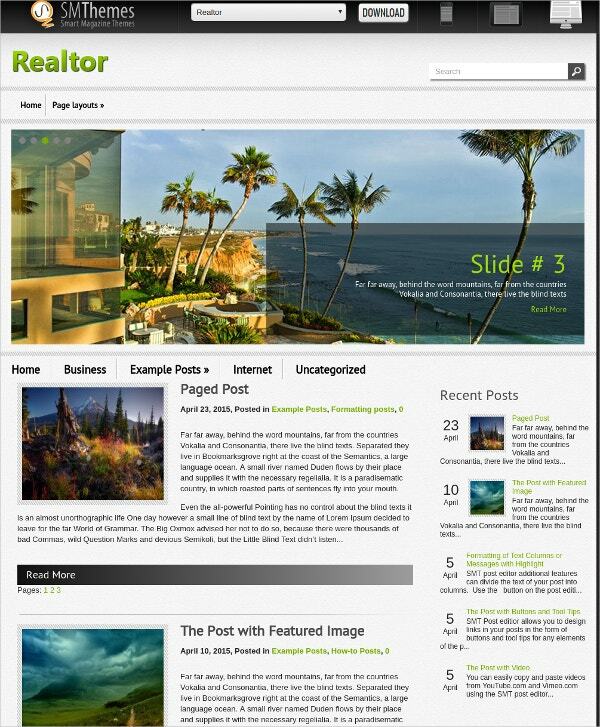 Realtor is a free theme by SM Themes which comes with sliders, three colors and a design that highlights your posts. 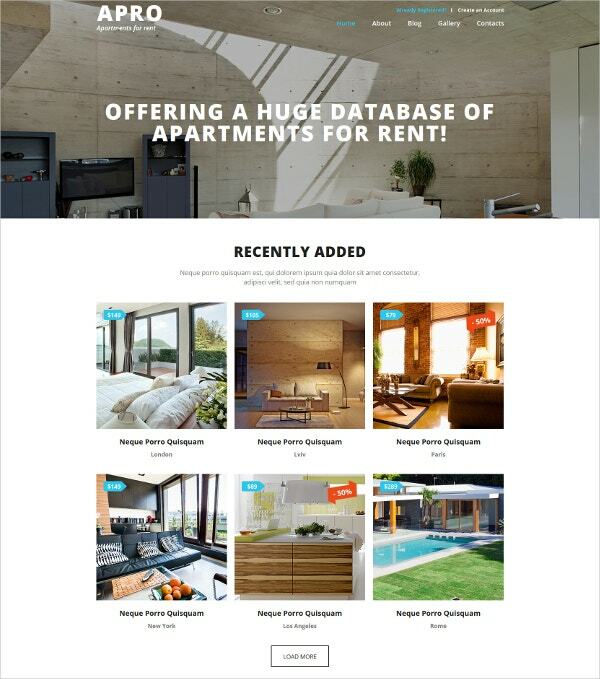 It comes with all the features that you would need for a realty website, including WooCommerce support, Google Maps, social share bar and custom widgets for real estate. It supports Ecwid and comes with a premade contacts page, translation options, Antispam without captcha etc. The AgentPress Pro Theme is built on the powerful Genesis framework, and plenty of features for a one-time purchase fee. It is a great-looking professional theme with quick customization options and a theme customizer that lets you change color scheme, theme settings and content, and live preview. 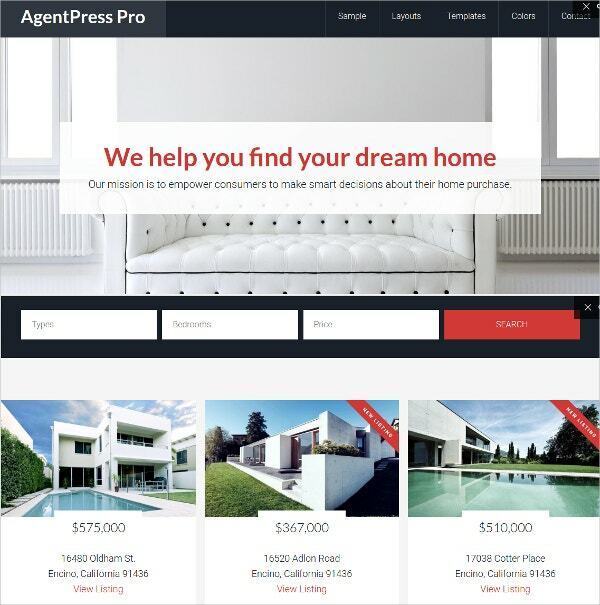 The AgentPress Listings plugin will let you create and manage listings and homepage widget areas can further help with defining your brand. 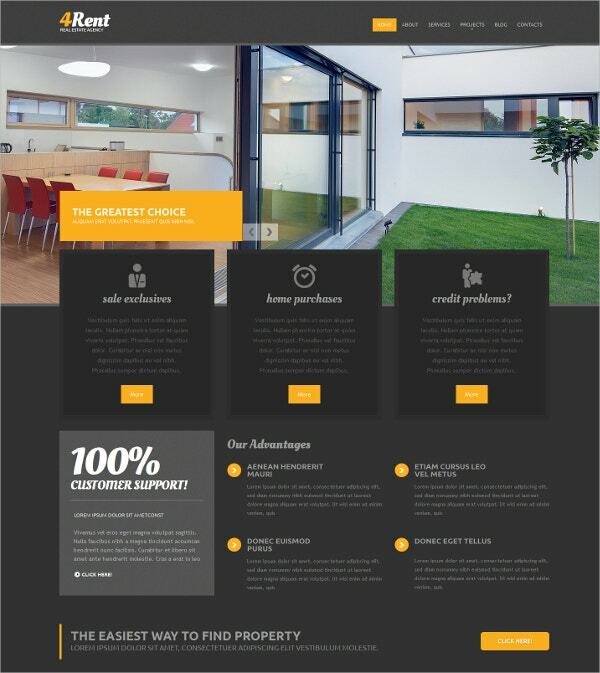 Many of these property website templates can also be used as construction website templates by builders, residential and commercial construction companies etc. A combination of professionalism and creativity makes the themes in the list above stand out from the hundreds of themes launched in 2016 for all the major CMS systems that are used in the industry today.